Despite loving it, my soup repertoire seems to be a little lacking. There was a time when I made my miso squash or roast cauliflower soup once a week without fail, which meant I always had a batch to turn to in the fridge for a quick meal – but I seem to have fallen out of the habit. 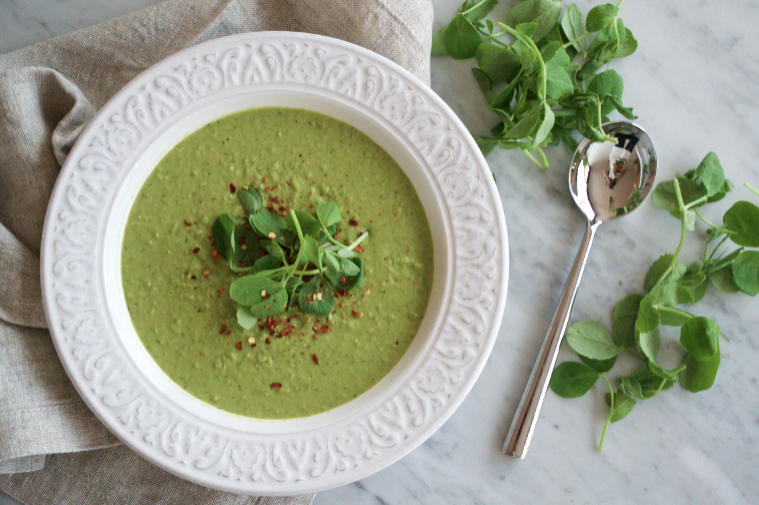 So, I decided to get back to it and reinvent one of my favourite summery soups, pea and mint, by adding the Thai flavours that always appeal to me. 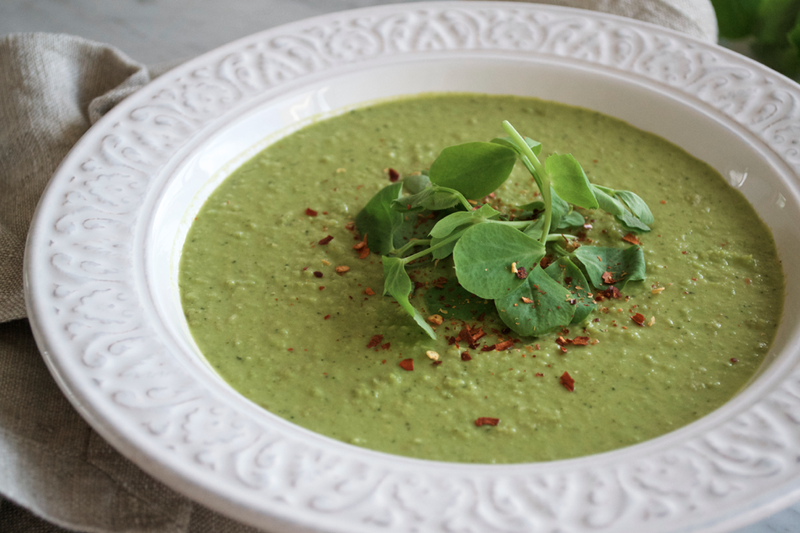 I know I’m a little biased but I really think I’ve hit the nail on the head with this one – it still has the freshness of a light pea soup but with a gentle hum of chilli and the richness of the coconut milk. Finely chop the ginger, garlic, lemongrass and chilli (if you’re a spice lover you could always add another half a red chilli). Next, heat the coconut oil in a medium sized saucepan over a gentle heat until melted. Add the shallots, ginger and garlic and gently sauté for ten minutes. 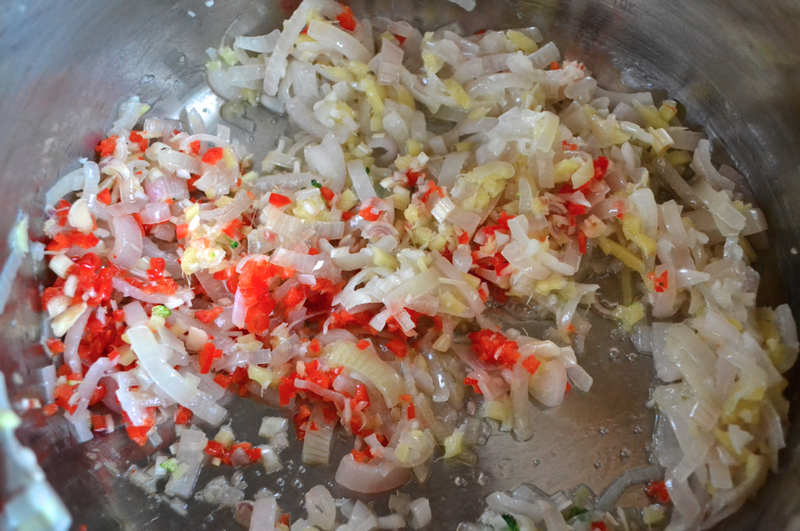 Pop in the lemongrass, chilli and salt and cook for another five minutes. The mixture will be nicely softened and very fragrant by now. 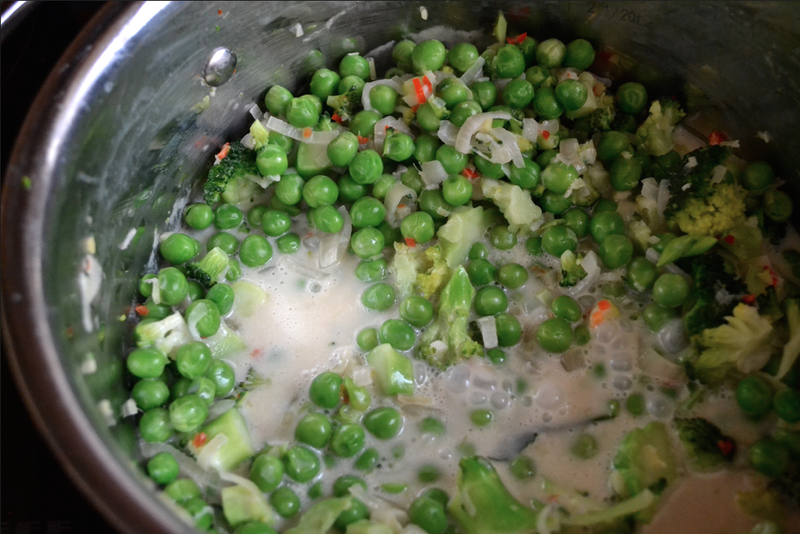 Add the broccoli and peas, mix through and cook for five minutes before adding the coconut milk. Simmer for around fifteen minutes. Blend the soup well – it might take some time to get a very smooth consistency. I added 1 cup of hot water mixed with the Boullion powder so loosen the soup – add a touch more if you prefer a thinner soup. I’ve added pea shoots and a helluva lot of chilli flakes to garnish.